In the mid-1920s, the increasingly prosperous Maccabees selected Albert Kahn to design an impressive modern office tower for them in Detroit's expanding Cultural Center. Kahn, by this time, had designed a number of office building but, although attractive because of their design and exterior detail, were rather rectangular and squat, such as the Detroit Free Press and Detroit News building located on West Fort in downtown Detroit, or reflected Daniel Burnham Chicago style of design as in Kahn's 1922 National Bank Building on Cadillac Square. By the time Kahn, designed the Maccabees Building, he sought an alternative for the very tall and rectangular skyscrapers erected in New York in this era. I believe that he succeeded in designing a more attractive building. For the Maccabees, he designed a 14-story tower, but with subordinate flanks. Thus, there are four six-story wings at the corners of the major tower producing an H pattern. The Art Deco influences from the 1920s are also obvious. It is easy to appreciate the change over time in Kahn's approach to designing large office buildings when you contrast the National Bank Buildingdesigned a few years before the Maccabees Buildingto the Maccabees Building itself and than contrast this building to the quite different and, perhaps, more attractive, Fisher Tower that he designed just a couple of years later. A walk along Woodward illustrates these changes in the design of buildings serving similar purposes. In 1960, the Maccabees organization moved to Southfield and sold the building to the Detroit Public School system to be used as their headquarters. In 2002, the Detroit School system purchased five floors of space in the Fisher Tower and vacated the Macabees Building. 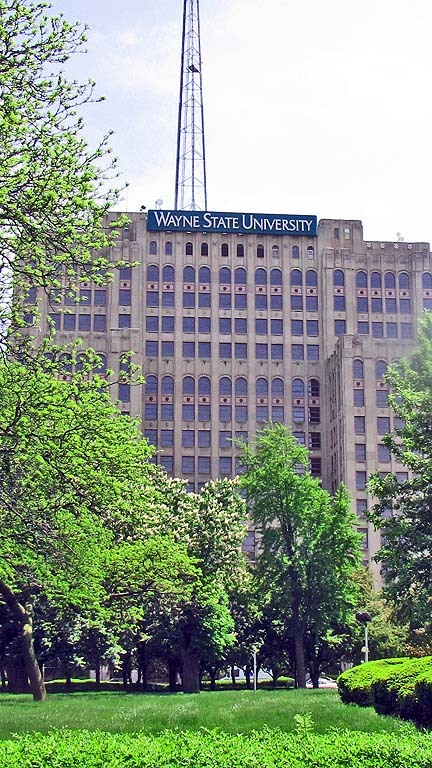 That year, it was purchased by Wayne State University and now provides office space for a variety of units including the Communications Department and their Computer Sciences program. I have often wondered about the origin of the name of this building. There are at least four Books of the Maccabees and two of them are included in Sacred Scripture by the Roman and Eastern Orthodox churches. They describe the revolt led by Judah Maccabees and his colleagues against the Seleucid dynesty that ruled Judea. The revolt began in 175 BC and ended in 134 BC. The Maccabees wish to establish and, perhaps, enforce more conservative religious practices than was tolerated by the Seleucid dynesty. I do not know why a group of men in London, Ontario selected this name for their fraternal organization. The Books of the Maccabees are treated as apocryphal by most Protestant biblical scholars and not treated as sacred in the Jewish tradition. There is one distinction about this building. For several decades, The Lone Ranger, was among the most popular programs in the era when radio was dominant. The first broadcast of the Long Ranger was from the studies of station WXYZ on January 30, 1933. Writers in Detroit in that era knew Spanish. As an indication of the benefits of political correctness, you might think that, today, no script writer would give the Lone Ranger's Indian sidekick the name Tonto. Use in 2017: Wayne State University.